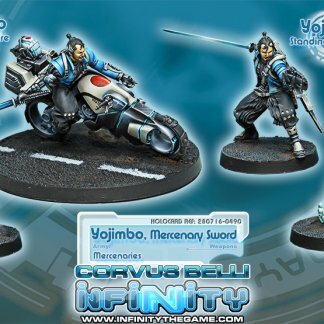 Rumor says that Yojimbo is the Recreation of the legendary character of Kurosawa, created as personal bodyguard for the CEO of a Japanese megacorporation of Yu Jing. Word is that Yojimbo, because of his unmeasured pride and his concupiscent character, fell into disgrace, losing his lord’s favor, and turning into a Ronin. He now wanders by himself without other master than his own will and without any other sustenance than that provided by his katana and his wits. This urban legend, never confirmed but never denied by Yojimbo himself, lacks any basis in documentation. According to a recent report of Bibliotek, there is no record that vouches for the story. Nevertheless, defenders of this version point to the fact that ALEPH has every necessary resource to recover any failed AI project at its disposal and to erase any file related to a possible failure. However, another version circulating through the data sphere talks about Sanjurō Wabatake, a Domaru from Sakuramachi. Sanjurō was expelled from the army because of some dark and unclean affair, and was killed afterwards by the Yakuza because of a yet darker and dirtier affair. He was then allegedly resurrected by the Fukurou ninja clan with a new body and purpose. Equipped with an Anāgāmī Lhost model, a class-3 body, two levels under the Bodhisattva model, Sanjurō would have heightened reflexes and also superior strength and resilience. Under the strict direct supervision of the clan’s Oniwaban, he polished his martial skills, becoming a swordmaster, a prodigious warrior like no other, whose lethal dexterity was added to an implacable character. 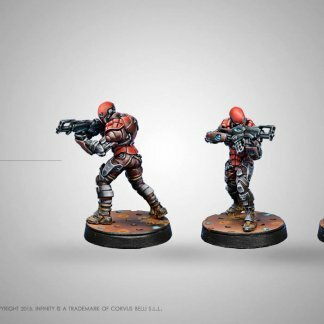 The Fukurou clan would have placed Sanjurō as the leader of a clandestine group called Nichibotsu (Dusk) dedicated to “make some corporate operations easier” in a way that sometimes bordered on international terrorism. However, after a short but intense career, the Akutagawa scandal forced the group to be disbanded to protect the honor of zaibatsu Koremune. Abandoned by the Fukurou clan and without a chance to recover his old status of Bushi because of his turbulent past, Sanjurō would have had to hide himself under the name of Yojimbo, starting a career as a mercenary sword, with alcohol and women as his only source of satisfaction. 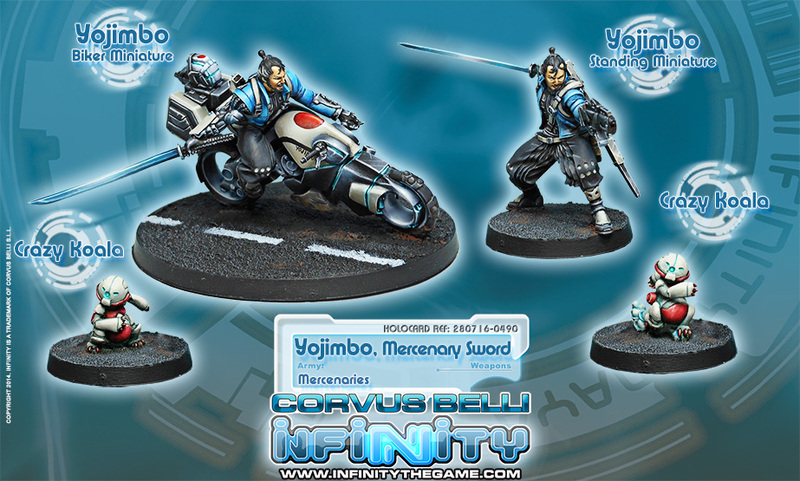 Whatever the real history is, whether one of these stories or another entirely, the truth is that the mercenary samurai called Yojimbo is one of the best swords you can find in the underworld of soldiers of fortune. He may seem to be an expensive and hard to hire professional, but in truth is he is the opposite, because the worst enemy of Yojimbo is himself. Hounded by debts, he started to sign the so-called “Giri Checks” (約束手形 義理), IOU notes of services. Anyone who signs a Giri Check is bound to serve the one who claims it for a task equivalent to the check’s value. Once the job is finished, the check is destroyed. The main problem is that Giri Checks work as international credit, circulating throughout the whole Human Sphere. These IOU’s are bought and sold depending on the prestige of the signatory and can fall into anyone’s hands. So, from time to time, Yojimbo is forced to take jobs he would prefer never to accept, too dirty or dangerous for any mercenary, but that he must solve with the blade of his katana or his particular brand of wits. He often chooses to work in a way that any real Bushi would reject as gross and dishonorable, but that he, and anyone else, would define as lethal and effective.